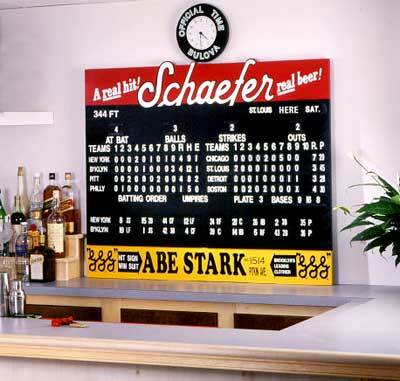 Ebbets Field Scoreboard – Brooklyn Dodgers Collectible Gift! Hands-on Fun For The Passionate Baseball Fan! If you’re the quintessential Brooklyn Dodgers fan, you’ve probably always loved old-school Ebbets Field, with its unique dimensions, idiosyncrasies, and of course, the manually-operated scoreboard (with a crew inside hanging numbered, tin panels onto screws from panes). There’s always been a certain mystique as to what goes on inside such a remnant of baseball’s past. Many a baseball fan has wished that for just one day he or she could run one of the vintage, historical, old-time scoreboards monitoring the action at such ballparks as Wrigley Field, Fenway Park, original Yankee Stadium and Ebbets Field. Well, now you can! Makes an unforgettable Birthday, Christmas, Hanukkah, Valentine’s Day, Wedding Anniversary, Retirement, Father’s Day, Mother’s Day, Bar/Bat Mitzvah or Graduation gift for your favorite Brooklyn Dodgers fan! Loaded with value! You get over 250 numerical tiles and all 30 MLB city team tiles, along with all player position tiles, ensuring that you’ll always have more than enough tiles to keep track of all scores. Comes with a durable, portable container for storing tiles conveniently and a handsome inscribed nameplate. Visually stunning décor for an executive's office, home library or study! Remarkably authentic graphics and artwork accurately replicates the Ebbets Field hand-operated scoreboard! The perfect décor for bars, restaurants, sports bars, sports card/memorabilia shops and sporting goods stores with a Brooklyn Dodgers fan clientele! Functional clock authentically replicates the Ebbets Field scoreboard clock! Just the right size – measures approximately 38 inches high by 48 inches long (approximately 3 feet by 4 feet), ½ inch wide (thick), weighs approximately 25 pounds. Large enough for scores to be seen easily at a distance, yet small enough to fit into most prospective display areas. (Dramatic, yet practical). Looking for the ultimate Brooklyn Dodgers gift for the passionate Brooklyn Dodgers fan in your life? One they’ll never forget? Maybe you’d like to treat yourself to an innovative, unique, exciting Brooklyn Dodgers collectible with timeless appeal. You’ve come to the right place! Most Brooklyn Dodgers memorabilia isn’t dynamic. T-shirts, hats, posters, autographs, jerseys – they’re all an important part of any serious Brooklyn Dodgers fan’s collection, but they just don’t have anything to do with what’s actually happening on the field. Ever walk into a friend’s house a few innings into the game? If you’re a typical baseball fan, what’s the first thing you say? “What’s the score?” “What inning is it?” “Who’s pitching?” This is what diehard baseball fans live for! It may not be possible to make it to every game, but when you own a Scoreboard Classics™, it’s the next best thing to being there! You’ll stay on top of all the action! Post scores of out of town games. Celebrate your team’s latest triumph with friends. Be an active participant in the drama that unfolds all season, from spring training – when hope springs eternal, through the dog days of summer, to the brisk autumn air of postseason baseball. Join your team through all the ups and downs of a pennant race that mirrors life itself! Don’t just watch the game. Live the game. Your own hands-on, authentic Scoreboard Classics™ will keep you part of the action season after season! A Scoreboard Classics™ never goes out of style! I was just a kid growing up in southeast Queens, Sacred Heart parish. My dad was a fireman. That meant he might work nights, Sundays, or even Christmas day. It also meant he might be off on a beautiful mid-week day in July. The Brooks are home, day game, and we're going! You drive down Linden Boulevard right into Brooklyn and onto Flatbush Avenue. Park the car on a nearby side street: no problem, all the other cars are away at work. Night games would always be a little tougher. A quick stop at the long, crowded bar on Sullivan Street; "A Schaefer, and a soda for the kid." (My time would come). We cross the street and get our tickets there on the first base side, upper deck and as always, in time for infield practice. Giamatti had it right; the eternal longing for the enclosed green place, reserved for sport, “paridaeza,” a park. Some thought Ebbets to be a small park. To me it was always more spacious and greener than the last time. More like a cavernous church or theater I think. We all knew the rituals, the plays and the players. It was our game and our park and Dixie Walker owned that right field screen just as Carl Furillo, today in center, would in years to come. And so for a few hours, lost in time and enveloped in space, we stood and cheered and clapped and booed along with thousands of others, “the faithful,” sharing an agreed upon fiction, a convention, that somehow it really mattered. We played the Cubs that long ago summer afternoon and I scored the game as I often did at home lying in bed next to the radio imagining it all. That day I was there! We beat them 5-3. Branca got the win with a clutch triple by the rookie at first, Robinson, driving in a run and then scoring on Arky Vaughan’s single. A fine day. As we filed down the steep passageways and then out onto the teeming street, life was good and all was well. Ebbets and the Dodgers would always be there. Abe Stark could relax again; no one ever hit that sign beneath the scoreboard to win a free suit…In time of course, it was torn down, desecrated. They put up a housing project. Sleep well, the ghosts are friendly, if somewhat spooked; the Cards and Musial are in town next week. By Dennis M. Shea, Professor Emeritus of Political Science, State University of New York at Oneonta. © 2010 Scoreboard Classics. All Rights Reserved.